Several years ago, we had the good fortune of being temporarily broke during the holiday season. We asked our children to make a decision: would they prefer to have presents on Christmas morning or traditional Norwegian food on Christmas Eve? It came as a relief to me that they chose the food over the gifts, as our December 24th supper is my favorite meal of the year, and non-negotiable, in my book. We spent that wonderful season cooking and eating together, enjoying each others' company during a simplified celebration free of the business of shopping. With the abundance of food websites that are dedicated to food online, I keep very few hard copy recipes. My Christmas recipes are the exception. Handwritten copies of heirloom recipes for lefse bread, Sandbakkel cookies, my Oma's chocolate cake, and Norwegian meatballs are carefully kept and treasured, food stains included. You may notice that I just referred to "Norwegian" meatballs instead of the Swedish moniker. This is because my grandmother, being Norwegian, would never have referred to her meatball recipe as "Swedish." But, with the advent of Ikea's influence, most people recognize a Swedish meatball, which is the same as a Norwegian meatball, with only a few minor differences, that don't matter to non-Scandinavians anyway. The addition of cardamom sets these meatballs apart from others. 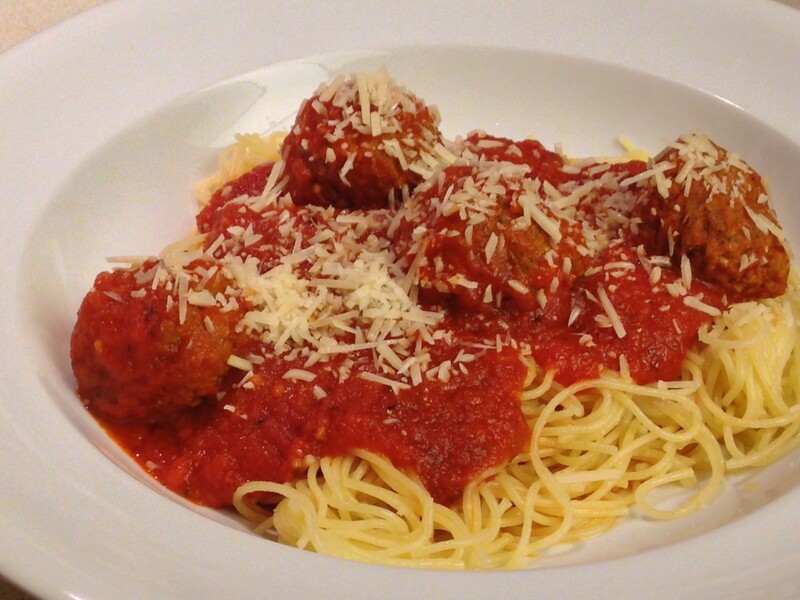 These meatballs are great all year long, especially during the holidays. They make a great addition to a holiday buffet, and are a wonderful comfort food for New Year's Eve. I have included both the meatball recipe and the gravy recipe. Enjoy! These meatballs are easy to make, but the mixing, rolling and browning take time. It is easier and more fun to work with a friend! Generally, I mix up the meat mixture, my husband rolls the meatballs, and I brown them. It's a beautiful partnership, with delicious results! Chop the onions very finely and brown them over medium heat in 4 TBSP of butter. Turn off the heat and allow the onions to cool to room temperature. With clean hands, mix the cooled onions with the ground beef, ground pork, bread crumbs, milk and beaten eggs. Mix LIGHTLY, or the meat will be tough and the meatballs will end up with a texture like rubber. In a small bowl, whisk the sugar, salt, nutmeg, allspice and cardamom together. Add to the meat mixture. Shape the meat mixture into 1" balls. Heat 4 TBSP butter in a skillet or pan on low heat, so the butter doesn't burn. Add the meatballs, and turn the heat up to medium. 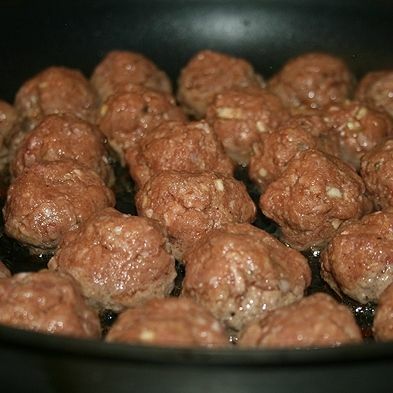 Brown the meatballs, shaking the pan to turn them to maintain their round shape. If you find it difficult to turn them by shaking, it is completely okay to use tongs, and the meatballs will taste just as good if they are not perfectly round. Remove meatballs, placing them in a serving dish. If you will be serving them right away, cover them to keep them warm. Note: don't clean your meatball pan yet! You will be using the drippings to make the gravy. During the holidays, I make the previous all-out, decadent version of the recipe to share with family and friends. When I was growing up, both my father and my Norwegian grandfather were professors who took a vital interest in their students. Around the holidays, we always had students, particularly foreign students, joining in our celebrations. I have included a photo of one of these celebrations. I am the little girl in the purple and white stripes. My tall, lovely Norwegian grandmother is to the right, in the red skirt and white blouse, and my beautiful mother is behind her left shoulder. 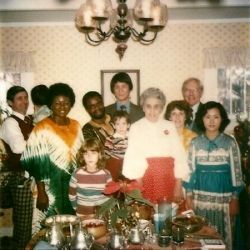 My mom and grandmother would cook for days, and the bounty was enjoyed by all. No low-fat recipes were allowed. Decadent recipes are great for the holidays, but if I were to cook these meatballs for an everyday meal, I would make a few healthier adjustments, starting with browning the onions in olive oil instead of butter. I would also bake the meatballs, instead of frying them in butter. I might also substitute ground turkey for a portion of the meat, and use whole milk instead of heavy cream for the gravy. What sets these meatballs apart from others is the addition of cardamom to the recipe. Cardamom is a spice native to the Middle East, North Africa, and, surprisingly, Scandinavia. 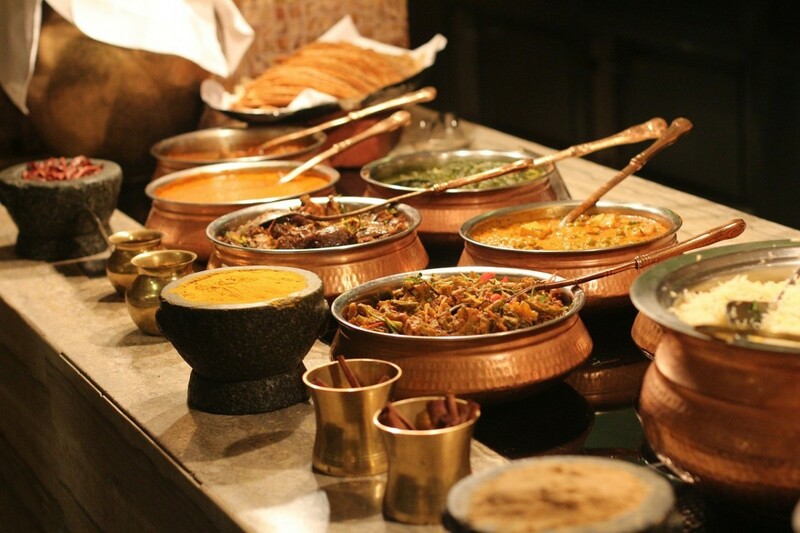 It is also known as the Queen of Spices, and it is integral to Indian curries, rice dishes and chai as well as Scandinavian cookies, breads and entrees. A member of the ginger family, it has a distinct flavor, and although it is pricier than other spices, a little bit goes a long way in recipes. Amazon carries cardamom and other quality spices at prices that are better than my local grocery store. Since Amazon offers FREE Super Saver shipping on qualified orders of at least $25, I like to stock up on spices and other ingredients that I use regularly. Note that if you purchase whole nutmeg or cardamom, you will need to grind or grate it just prior to using it in a recipe. This is a little extra work, but it adds a depth of flavor that can't be achieved by previously ground spices. Ground spices are certainly convenient to buy and use, but they lose potency rapidly due to exposure to the air. Whole spices are less expensive in the long run because less is needed to achieve the same level of flavor. But grinding or grating them is an added step to creating a recipe. Is it worth the trouble? Do you grind or grate your own spices? If so, which ones? Tell us about it in the comments section after you vote. 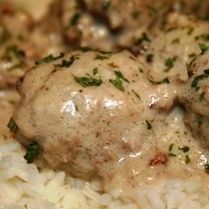 The best part of eating Swedish meatballs is enjoying the cream gravy. It truly is the ultimate comfort food, great for dipping bread or Norwegian lefse, and the perfect topping for potatoes or noodles. If you have tried the cream gravy that comes in dry packets at Ikea, it is good...but nothing so delicious as this recipe. Start with the drippings from your meatball pan to create gravy that is not just a food, but an experience. Add flour to the fat in the skillet and whisk briskly until the flour browns and fully incorporates into the fat, with no lumps. Slowly add heavy cream to the skillet, whisking between additions. Add the sugar, salt and pepper, and bring the mixture to a simmer, stirring constantly. Allow the gravy to thicken, adding water slowly, until the consistency is thick, but not pasty. Pour the gravy into the serving bowl, over the meatballs. Garnish with fresh parsley (optional.) Serve immediately over mashed potatoes, rice or egg noodles (...or Ikea-style with French fries.) Add a dollop of lingonberry jam to make the flavor experience complete. Lingonberries are resilient little berries that grow well in the cold, wet climates of Scandinavia and Denmark. A lovely bright red berry related to the cranberry, lingonberries have a uniquely sweet-tart flavor that makes a delicious jam. In Scandinavia, they are not only considered a fruit for dessert or jam, but also as a condiment for savory dishes, both white and red meats, similar to a chutney or cranberry sauce. Lingonberry jam is also wonderful on crepes or pancakes, is a delicious ice cream topping, and tastes heavenly with crackers and cheese. If you've never tried lingonberry jam, treat yourself today! Although we rarely have enough meatball leftovers to freeze, I occasionally make them in advance and store them in the freezer for Christmas. Freeze the meatballs and gravy together in an airtight container, and thaw thoroughly before reheating. Cover and slowly reheat in a 325 degree F oven. I have included a photo of our family preparing to eat our Christmas Eve. 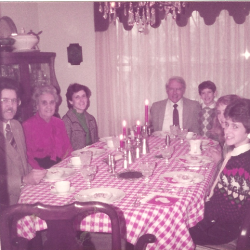 It was always a festive and dressy dinner, which consisted of several courses: rice pudding and fruit soup appetizers, followed by meatballs, lefse bread, lutefisk, mashed potatoes and a vegetable. We concluded with Scandinavian desserts, such as fattigman, sanbakkels, krumkake and rosettes. 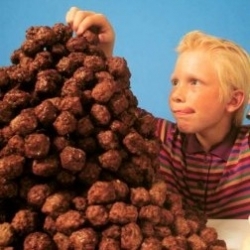 But the highlight was always the meatballs! 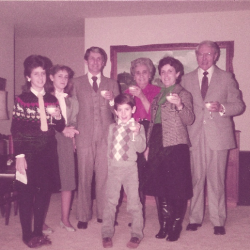 I hope that your family and friends will enjoy them as much as we have over the years. From my family to yours, Happy Holidays and Good Eats! 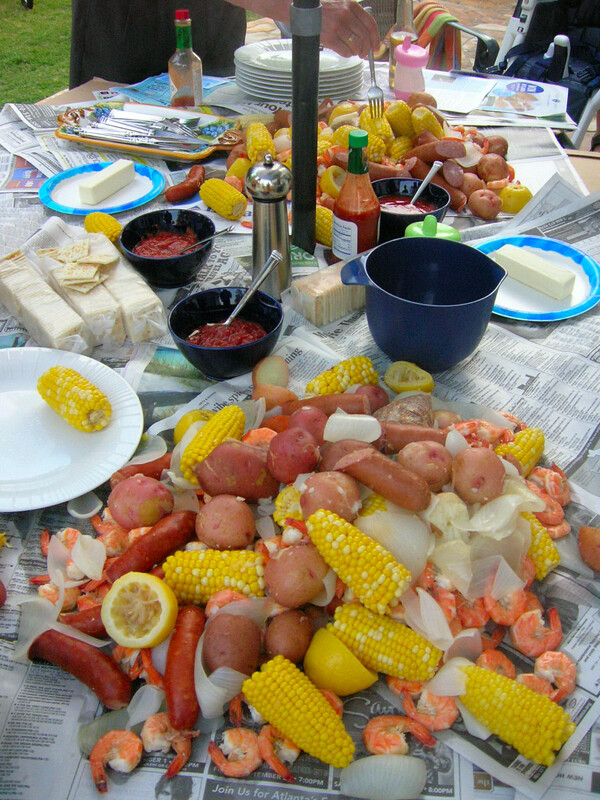 I hope that you enjoy this recipe and that you will take a look at some of my other recipes posted on Squidoo. Here are some places on the web that I love. If you have a related lens or link that you would like posted here, send me a message and I will post your link. Kindly link back to this lens from your webpage. Noun skÃ¥l c a bowl; a container a toast; a raising of glasses while drinking and saying "cheers!" Welcome to Kerry's Island Kitchen, Kerry's Island Kitchen is a weekly column published in the Gabriola Sounder, Gabriola Island's weekly newspaper. Delicous swedish meatballs this is one of my favorites my mom use to make for me. Easy recipe makes great leftovers. Serve with pasta or rice. You haven't had a good open-faced sandwich in a long time, and you thought this might be the place? Curious to see what the term "Norwegian cuisine" covers today? Try your hand at some of the following recipes. Love Norwegian food? Find new and traditional Norwegian Recipes in English here. Addicted to Recipes: Scrumptious Sunday Link Party! Delicious Appetizer Recipes perfect for a super bowl party. I would love to hear from you. What are some of your family's holiday traditions and recipes? Thanks for sharing this recipe, sounds delicious!